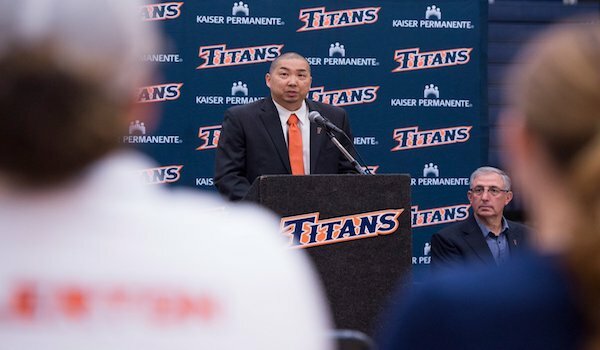 Can you take us through the process up until you were officially named the new Head Coach at Cal State Fullerton? I had just wrapped up my third season as Head Coach at Central Washington University. It was my second Head Coach position, with the first being at Hawaii Pacific University. Both were Division II universities where I was tasked with rebuilding struggling programs. Before Central Washington, I was an Assistant Coach at the U.S. Naval Academy in Annapolis, MD for three seasons working for Stefanie Pemper. I was very happy at Central Washington and the work we did to build that program up from the bottom of the league. With six seniors, 2017-18 was going to be the best season yet so my staff and I were preparing for that. However, when the opportunity at Cal State Fullerton arose, it was something I had to look into. Competing at the highest level as a Division I Head Coach was always the goal, but finding the right fit was really important to me. Being a West Coast guy, I wanted to stay in this region and be a part of a program that would challenge me and allow me the opportunity to put my imprint on the program. I knew there hadn’t been much success at Cal State Fullerton for as long as I could remember, so I definitely had some reservations and questions going in. During the first interview with the committee however, I felt a strong connection and was impressed with the desire, support, and commitment of the administration to have a successful women’s basketball program. After arriving back in Washington that evening, Athletic Director Jim Donovan called and offered me the position. We agreed on terms of the contract and after that, it all happened pretty quickly, flying back for the press conference and moving. The hardest part though was having to leave the program I had built the last three years and telling those kids I was no longer their coach. In all honesty, I was nervous yet excited with a range of emotions, but I knew in my heart that this is where I was meant to be. How did your experience as a collegiate Head Coach at the DII level prepare you to lead your own DI program? Being a Head Coach in Division II, you do more than what Division I head coaches do. In DII, you don’t have the full allotment of assistants who can help out in the non-coaching or administrative side of the program. Because of this, I had extensive hands-on experience in all phases of running and leading a college basketball program. I wasn’t just a recruiter, just a player development coach, just a coach who handles travel, equipment, and logistics, or just a coach who prepared scouting reports. I actually did all of it, so having the experience and knowledge in all areas of the program was very beneficial. I was also able to gain valuable experience running practices and managing games from that first seat. After years as an Assistant Coach, I really needed that. Getting game experience and that feel from the sidelines really helped prepare me for where I am today. What were your priorities over your first 30 days as Cal State Fullerton? Priority number one was getting to know the players. Not just as basketball players, but who they were as young women. Where were they from. Why they choose to come to school here. What their family was like. What their majors and hobbies outside of basketball were. What their experience like up until now was. What goals did they have for themselves before they graduated and began their life and careers in the real world. I also wanted them to get to know me as well as my goals and vision I had for our program. After that, it was hiring a staff that would help me accomplish the goals I had in mind for our program. I needed coaches who not only knew the commitment needed to do that, but who had the character and work ethic I wanted to instill in our program. I needed them to lead by example to be not just coaches, but mentors for our players. Finding assistant coaches who I could trust was very important. Next was finding the players to bring in to our program. When I got hired, we had five players on the roster and four incoming recruits signed by the previous staff. Two of them elected to request a release from their National Letters of Intent so that left us with seven players on our roster. Being it was so late in the recruiting process, the challenge was to not just find the best players still available, but more so the right players. Players who had strong family values, character, work ethic, and great teammates who truly cared about school, their future and the desire to be a part of the rebuilding process of our program. After those things were done it would be time to implement the structure and plan to change the culture of our program and create the winning environment we want to establish. Knowing what you know now as a Division I Head Coach, what advice do you have for assistant coaches to best prepare to lead their own program for the first time? My advice would be to have patience, appreciate the job you have, and strive to be the best assistant you can be for your Head Coach. Basically, learn all you can, be good at what you do and take pride in your work. Ask questions and don’t think you know it all. Don’t be in a rush to become a Head Coach, especially at the Division I level. It’s ok to gain experience at lower levels to perfect your coaching style and develop your philosophy. When the opportunity does arise, make sure you are ready and prepared for it with a plan in hand because more often than not, you’ll get one shot and if you aren’t fully prepared it might be your last shot. I think the assistants that struggle in their first head coaching job struggle not because they aren’t good coaches, they just aren’t ready for it. They don’t fully understand the scope of what the job entails and what needs to be taken care of behind the scenes. Being a Head Coach is more than just the X’s and O’s. You now oversee the entire program and have to make tough decisions that will affect the entire team in different ways. Remember that communication is vital in managing your players, as well as your staff, to ensure everyone is always on the same page. Lead by example and practice what you preach. You can be firm, but you must be fair or everyone will see right through you and the team will become divided. Lastly, you have to pay attention to the details and the little things. Don’t let things slide or think it’ll just go away and take care of itself. It’s those details and little things that are the difference between winning and losing programs.